Michael Snader holds multiple nationally recognized personal training certifications including a 500 hour Personal Training and Nutritional Consultation certification and diploma from the National Personal Training Institute in Philadelphia, PA. He has been hands on in the health and wellness industry for over 10 years and has held positions as a Personal Trainer, Wellness Coach, and Senior Manager of a large fitness facility based in the US. In addition to his professional career Mike has also volunteered to organize and direct 5K running races to benefit charities, and has been invited to speak at numerous influential Wellness Summits and Seminars. 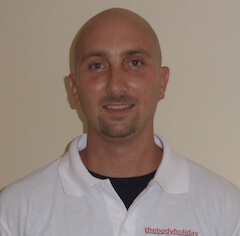 He was the former Nutritionist and now BodyAware Program leader at The BodyHoliday in Saint Lucia.